Ghana public transport system has been fraught with many challenges for a long time. Thus the infrastructure – roads, vehicles, human resource, etc had faced a lot of problem. Though past government have try to solve the problem there still remain challenges that all need to solve. I will first like to recommend the management of Metro Mass Transit of the measures put in place to strategies, revamp and make service more accessible and relevant to the public. 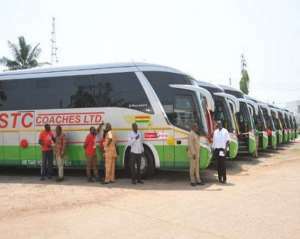 State transport Corporation company owned by the Social Security & National Insurance Trust (SSNIT) (80%) and the Government of Ghana (20%) in recent years has seen a major boost in the transport industry. Though there had been competition with private transport such us VIP,VVIP,OA and the rest,STC continues to show a can ‘do spirit’ that all is not lost. Retraing and rebranding of drivers, inconsistent WIFI service on the coaches is being revamped. Workers/Staff welfare had been top priority. All this measures should not be given a deaf ear and blind eye. I say Ayekooo. There are also other observations which I will like management of State Transport Corporation to take a look. Faith communities in the past years had organized their own transport for events with mostly private operators within the country .The reason may be time, communication and reliabilty.Service personnel need to get in contact with all faith communities and plan with them when they need their service.There should be monitoring of all programs of faith communities by management of STC. Also most institutions in Ghana lack buses. There are many second cycle schools and tertiary institutions that always rely on private buses to take their students home when school goes on break (vacation). Management can employ more graduates to move to this agency and help arrange for buses for students leaving home etc. Management shouldn’t live that to Metro MASS Transits but remember that transport business is more of a competitive business. This deal with branding of all products that are given to passengers in the bus and even terminal station.Managemnet can produce their own products and not rely on other parties.Thus,they can produce sachet water or bottle water with their own brand name and deliver to all STC terminal station and bus. Water is truly life. No water no life. Management should adopt this to earn more revenue. This can even create more employment for the youth.